My boss gave me a digital camera for Christmas, so I was anxious to try it out. I asked my daughter, Emma, to accompany me to Campton Hills Forest Preserve, Kane County, Illinois, for a short survival walk. I have very little winter hiking and camping experience, so I wanted to practice some cold weather fire starting: it seemed as good an excuse as any to get out! Nothing particularly exciting or unusual here: just a chance to get outdoors with my daughter and to play with the new camera. I've never seen so many people at this Forest Preserve! There was a lot of snow and a lot of kids enjoying their last day of vacation. 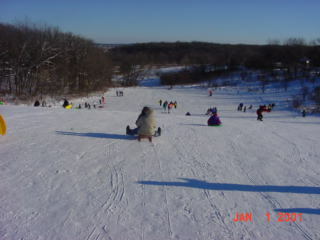 Emma saw a friend and joined her for about a half dozen rides down the hill sledding. 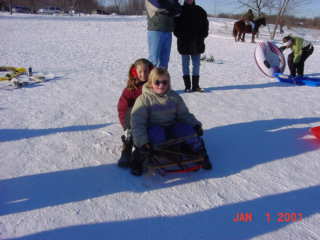 We don't get much opportunity for sledding so I told Emma that if she wanted to just sled with her friend that I would understand. Imagine my surprise when she told me, "No, I want to go hiking with you instead." That's my girl! We hiked about a half mile into the woods and found a place where I could practice my skills. 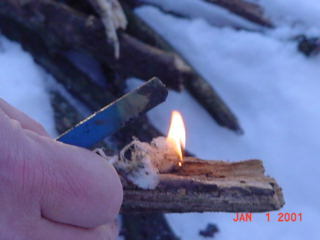 My first attempt at fire starting was a little careless and consequently a failure. 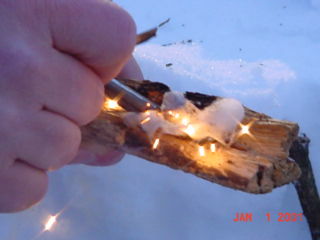 I used small twigs for kindling. That would have worked just fine in the summer, but not in this cold (approx 20 degrees?) I was more deliberate the second time around. 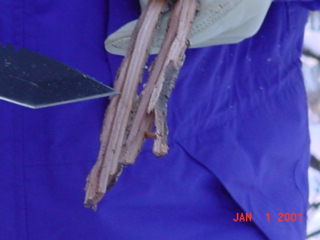 I used my Anaconda knife to split a few one-inch oak branches into quarters. 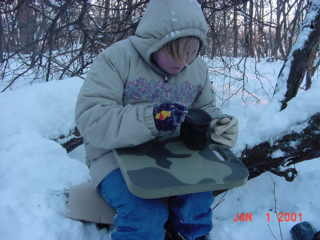 This is me splitting the wood. 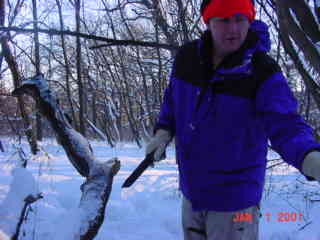 First lesson learned: Always take a fixed blade knife capable of splitting wood whenever you go hiking in winter! Another shot of me. 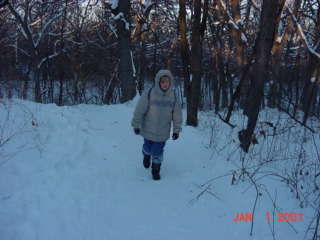 One nice thing about having a digital camera is that the kids (Emma) can take as many pictures as they want at no cost! The Anaconda knife does such a good job of splitting wood! Here's some of the kindling. Note the leather gloves. Second lesson learned: Bring leather gloves in addition to mittens. Mittens are great for warmth, but not for work. With all this split wood, I will have no trouble starting a fire! Note the foam pad I am kneeling on. Looked good at the K-Mart, and I'm sure it's fine for sitting on, but my knees got wet as I was kneeling on it to prepare the fire. It's just too small. Third lesson learned: Much better to use a thinner but larger piece of closed cell foam from an old sleeping pad. Time to get the fire going. I used a sparking rod. Cotton balls dipped in Vaseline make the best tinder! A single cotton ball dipped in Vaseline will burn for several minutes. Half a cotton ball is usually more than sufficient! 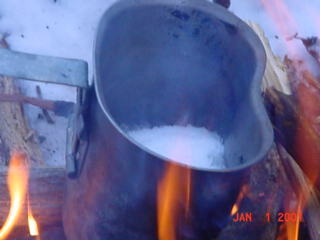 You can't see it in this picture, but I used a small shovel to clear the snow so I could build the fire on the ground. 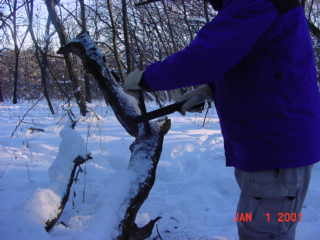 A small shovel is really nice to have along on a winter hike! 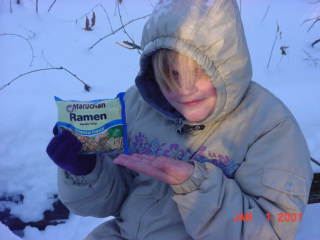 Emma looks forward to some warm Ramen soup! At last, Emma enjoys the fruits of our labors. Finally, a parting shot of Emma as we leave the woods. We both had fun and learned something. 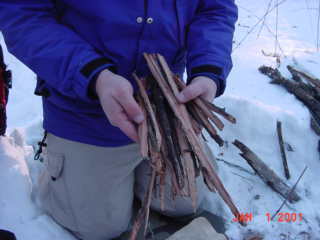 Summary of lessons learned: Whenever I go hiking in the winter I will take with me (1) a fixed blade knife capable of splitting wood, (2) leather gloves in addition to mittens, (3) a thin closed-cell foam pad at least 2 feet by 2 feet, (4) TWO containers capable of melting snow. Copyright © 2001 by Bill Qualls. Last updated January 1, 2001.